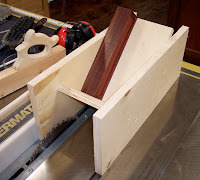 If you want to build boxes with splined miters, using a jig like this along with your table saw makes the job easy. The cradle i s made of two boards attached at 45 degrees to two outer boards. Your box sits in the jig which rides along the table saw fence while the blade cuts a perfect kerf in each corner. Move the fence to make a second kerf in each corner if you like. 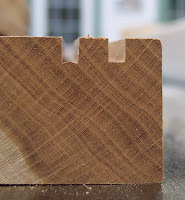 If you use a flat tooth blade, the bottom of the kerf will be flat and your miter key will fit right in. If you use an ATB (alternate top bevel) blade, you'll have a little clean up to do with a chisel in order to flatten the bottom of the kerf so the key fits snugly. That's the groove created by a sawblade, the width of the saw cut, like in the last photo. Cute doggies! The first time I used oven cleaner on my blades, as I was drying them off, I noticed some gummy stuff on my fingers. Hmmm. Turns out it was my SKIN——I hadn't read the directions on the can and had not worn gloves when using the oven cleaner. Eeuuww! Oven cleaner does work great, though. Thanks Ron! I just read somewhere recently that Simple Green also works pretty well. Thought I'd try that next and save my skin. Do you think you could build an instrument case? Hmm, not sure Wyldth1ng. I do have a friend who builds musical instruments (harps, lyres, and bowed psalteries) as well as instrument cases. Probably he could build one for you. Let me know if you want his contact info. It may be best to wait till I get back to the states, but I would like the info. I'm curious as to why you don't add a piece on the jig that would straddle you rip fence. This would prevent any side movement while cutting. Hi Joe, you certainly could add a piece to straddle the fence, but I believe it's overkill. You put sideways pressure on the jig as you run it through the blade, just as you would a board, so it stays tight against the fence. I've never had any problems with sideways movement, but you could very well redesign the jig to straddle your fence and remove any possibility of that happening. Nice jig! 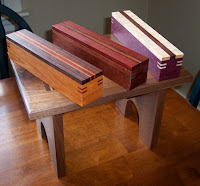 I have some splined miters to do and have been looking at people's various solutions online. I like yours the best! Thanks for sharing. Edward, good luck with your splined miters!